Pigeon Frame | Pigeon Picture Frame - F.A.Q. Still have questions? Here are some answers to our most asked questions about the Pigeon Digital Photo Frame. You can also visit our tutorial section. Carefully crafted answers to some of the questions you may have about the Pigeon Digital Photo Frame. Visit our Tips and Tricks section for detailed tutorials on getting started with your Pigeon Digital Photo Frame. Q: Which mobile devices can I use with the Pigeon Frame? Android* or iOS mobile device using The Pigeon App. and 5th Gen iPod Touch and beyond, as well as Android 4.1 and beyond. *Photos only at this time. Q: Will I be able to push pictures directly from my mobile device, iOS app, Flickr etc? Q: Will I be able to push pictures directly from my mobile device, iOS or Android app, Flickr etc? Yes, you will be able to push directly from your iOS or Android photo app. 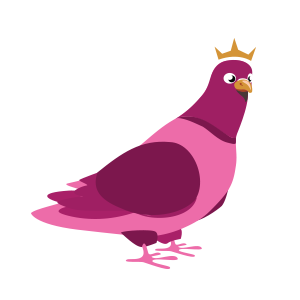 The Pigeon app will be available in the share section of your photo stream. the Pigeon App located in the share bar. Your synced picture frames will appear, choose the Pigeon frame you'd like to send to and off it goes. Each frame stores 2GB (approximately 1200 photos). that a slide show of about 30-40 pictures is optimum on each Pigeon picture frame. Q: Do the photos cycle in a repeated loop? The photos will be showcased in a slideshow format from oldest to newest. Grandma can "interupt" the slideshow, to view a specific image is she wishes. Using the remote, she can navigate forward, backwards and pause on any specific image. Q: Will the frame still display images when the Wi-Fi is turned off? Q: Will the picture frame still display images when the Wi-Fi is turned off? to show even if the Wi-Fi connection is lost. Any new pictures will appear once the connection is re-established. for a full refund, within 30 days of delivery of your shipment (including gifts). Click here for our full return policy.